CETROVO, the latest, carbon fiber metro train debuted at Innotrains 2018 in Berlin on September 19. It was launched by CRRC (China Railway Rolling Stock Corporation, the company), the world’s largest rolling stock manufacturer. 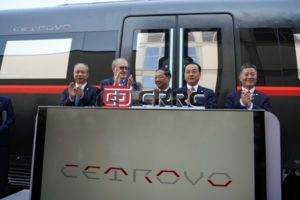 Mingde Shi, the Chinese Ambassador in Germany, Yongcai Sun, the President of CRRC, Jun Wang, Vice President of CRRC, Prof. Werner Hufenbach and Ma Yunshuang, the General Manager of CRRC Sifang witness the launch of CETROVO. The new train is 13% lighter than traditional steel or aluminium metro trains, making it the company’s lightest and most energy-efficient to-date and the first of its kind in China. 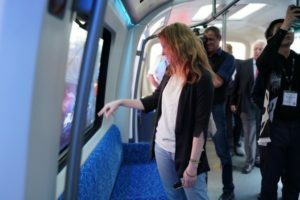 The new vehicle also has a range of “intelligent” design features including “magic windows’ and touch-screen enabled mirrors for a digital age of passenger travel. CETROVO aims to provide passengers with a “smart service” and includes a series of advanced technical features. For example, car windows that can be transformed into touch-screen displays. Passengers can watch the news, browse the web, buy tickets, watch videos and live TV shows all via CETROVO’s “magic window”. The train also comes equipped with internet-enabled touch-screen mirrors; self-cleaning seats; advanced vibration and noise reduction technology; an integrated hearing-aid system; and an air conditioning and lighting system that can ‘react’ to changing conditions for a more enjoyable journey. Over 1,100 sensory points to monitor the train in real-time to optimise efficiency and reduce maintenance costs. Sun Yongcai, President of CRRC, said “Rail transit equipment is on the cusp of a revolution. The acceptance and introduction of carbon fiber materials have allowed for lighter, more energy-efficient trains. With that now comes the continual introduction of more intelligent services aimed at improving the maintenance, operations, and passenger experience. Moving forward, CRRC will continue to invest in research and development and the application of new technologies and carbon fiber materials on 600KM high-speed Maglev trains, high-speed EMU’s and subways”.